Will Cars Go Green under the ACT’s Reformed Vehicle Purchase Tax? The Australian Government is reviewing its climate policies during 2017 to ensure that they, “remain effective in achieving Australia’s 2030 target and Paris Agreement commitments”. Part of the review will look at complementary policies by various Australian State and Territory governments, in line with the National Energy Productivity Plan (the Energy Plan), which was launched by the Council of Australian Governments in December 2015. The Energy Plan sets a target of 40% improvement in energy productivity between 2015 and 2030, and is expected to contribute more than a quarter of the savings required to meet the nation’s 2030 climate target. The Australian Government established a Forum and Working Group on Vehicle Emissions, to explore ways to meet the Energy Plan’s targets by reducing CO2 emissions in new vehicles and influencing consumer choice. The ACT Government has proposed a new stamp duty measure in its Vehicle Emission Reduction Scheme, which aims to influence consumers into choosing fuel-efficient vehicles by varying the rate of duty on the basis of CO2 emission bands. That is, the “differential duty scheme” is meant to provide an incentive for the purchase of lower operating emission vehicles and a disincentive against the purchase of vehicles with higher operating emissions. 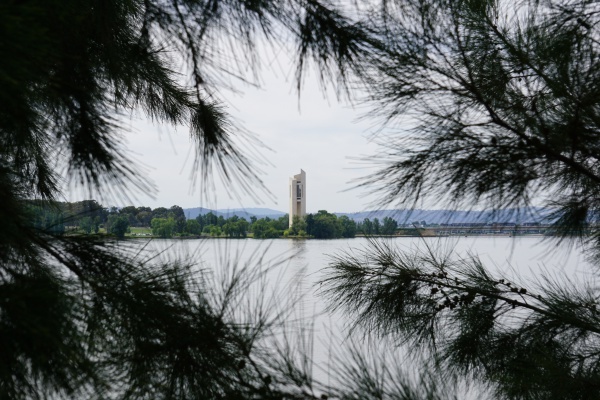 The ACT government deserves credit for being the first – and only – Australian jurisdiction to introduce green duties. However, the design of these measures mean that they will not be effective in significantly shifting consumer purchasing patterns and achieving the ACT’s ambitious emissions reduction targets. The ACT introduced its Green Vehicle Duty Scheme (GVDS) on 3 September 2008. 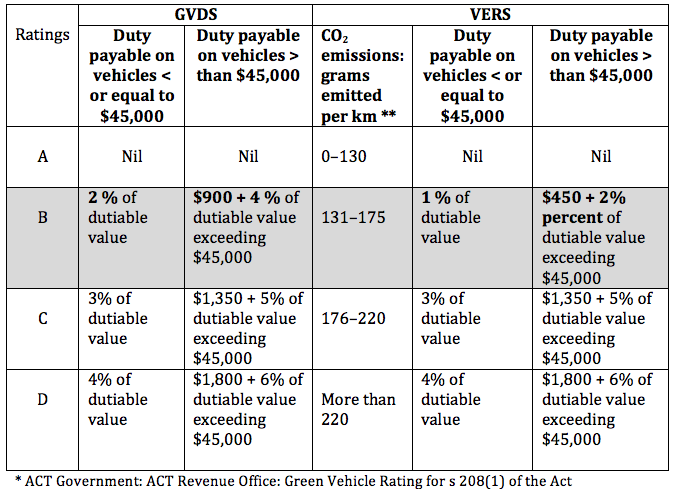 The ACT was the first jurisdiction in Australia to reform its vehicle stamp duty on the basis of the new vehicles “green vehicle star ratings” of “A”, “B”, “C” or “D” provided in the former Green Vehicle Guide as shown in Table 1. The ratings were based on the sum of the new vehicles’ greenhouse and air pollution ratings. At the time, the ACT Government regarded the Green Vehicle Duty Scheme as an important climate policy instrument to meet its ambitious legislated emission reduction targets of 40% below 1990 levels by 2020, and zero net emissions by 2060. My analysis of 2015 concluded that the tax design and price signal of the Green Vehicle Duty Scheme failed to meet the objectives of the ACT Government to significantly reduce CO2 emissions. I recommended at that time that the tax design of the Scheme should adopt CO2 emission bands and a stronger price signal. In 2015, the ACT Green Vehicle Duty Scheme was replaced by a new scheme called the Vehicle Emissions Reduction Scheme (VERS), which commenced on 29 June 2015. In 2016, I reviewed the new scheme. My findings do not support the ACT Government’s claim in its discussion paper “Low Emission Vehicle Strategy” (LEVS), released in June 2014, that the Green Vehicle Duty Scheme for the period (3 September to June 2011) “had influenced a market shift in the new vehicle market” on the basis of movement in vehicles sales between the environmental performance ratings between A, B, C and D rated vehicles. For example, the price signal of the D-rated higher CO2 emitting new vehicles in the Green Vehicle Duty Scheme did not shift consumers choice away from high emitting vehicles and the same price signal was adopted in the new Scheme’s CO2 emission band (more than 200g/km) for D rated vehicles as shown in Table 2. In Europe, the reform of vehicle purchase taxes/stamp duty has significantly accelerated the transition to low-carbon technology and meeting EU’s mandatory emission target of 130g/km by 2015. Therefore, if properly designed, a vehicle purchase tax could be effective in the ACT in significantly reducing CO2 emissions by shifting consumers’ purchase trends to fuel efficient, low CO2 emitting vehicles. However, to be effective, the tax requires a suitable design, strong upfront price signal, a level of tax differentiation between different kinds of vehicles, public acceptance and suitable interaction with other climate policy measures. The previous tax design and price signal problems have not been improved in the latest ACT Vehicle Emission Reduction Scheme. The former performance ratings of A, B, C or D were adopted, but were based on CO2 emission bands per kilometer as shown in Table 2, in place of the “green vehicle star ratings” of the former Green Vehicle Guide. The tax design of the VERS CO2 emission bands were not sufficiently differentiated and continued to adopt the former vehicle performance ratings; could not be assessed against any national regulatory CO2 emission standards because such standards do not exist; and were not harmonised with international or OECD average CO2 emissions for new vehicles. 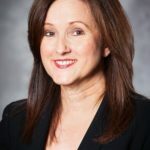 The ACT Government did not adopt stronger price signals in the new Scheme than the current 1% to 6%, and made only minor changes to the price signal for “B-rated” vehicles. There was also no change to the price signal for high CO2 emitting vehicles with emission exceeding 200g/km. The vehicle tax/duty exemption for “A-rated” new vehicles (in the CO2 emissions band between 0 to 130g/km) was too broad to promote and influence consumers choosing alternatively fuelled vehicles, such as battery electric vehicles and plug-in hybrid vehicles. An instructive case study of a successful tax scheme is that of Ireland and the Netherlands. Each country has stringent vehicle purchase taxes that have successfully reduced the average CO2 emissions of new vehicles. This is because they implemented strong up-front price signals that are differentiated so that taxes for all energy effective cars are significantly lower than taxes for cars with poor energy efficiency. My analysis in 2016 of the new Scheme is no different to the 2015 analysis of the former Green Vehicle Duty Scheme. Minor changes made in the Vehicle Emission Reduction Scheme will fail to achieve the ACT government’s objective in providing the required incentive to shift consumer’s car purchasing trends to fuel efficient, lower CO2 emitting vehicles. The ACT Government’s ambitious CO2 reduction targets of 40% below 1990 level by 2020 will not be met by significant cuts to road emissions without significant further reforms. This blog article is drawn from Anna Mortimore, “Will cars go green under the ACT’s reformed vehicle purchase tax?” Australian Tax Forum [Vol.31-4_2016], published [01 February 2017].